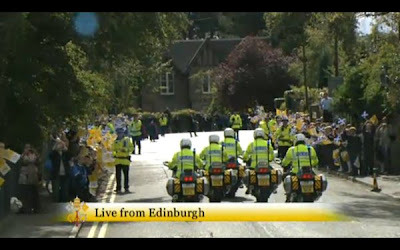 What a stirring start to the visit of the Holy Father! After the speeches in which Pope Benedict and the Queen demonstrated that they are of one mind on the importance of Christianity in the public square, the Holy Father went for his first popemobile drive. 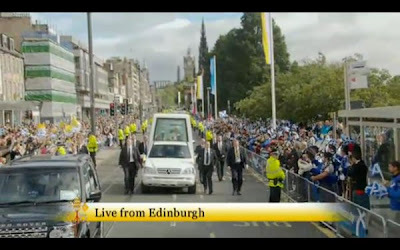 Sky News estimates (now confirmed by the Police) that there were 100,000 people lining the streets to welcome him. UPDATE - police revised that up to 125,000. They routinely underestimate numbers for public events so as not to be accused of partisanship. Prizes for the first secularist piece-to-camera along a quieter stretch to begin "So. 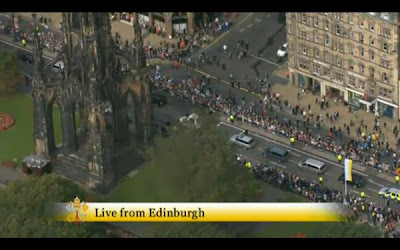 Disappointing turnout then John?" Ah! it's a brave kirk — nane o' yere whig-maleeries and curliewurlies and opensteek hems about it — a' solid, weel-jointed mason-wark, that will stand as lang as the warld, keep hands and gunpowther aff it. It had amaist a douncome lang syne at the Reformation, when they pu'd doun the kirks of St. Andrews and Perth, and thereawa', to cleanse them o' Papery, and idolatry, and image worship, and surplices, and sic like rags o' the muckle hure that sitteth on seven hills, as if ane wasna braid eneugh for her auld hinder end. Sae the commons o' Renfrew, and o' the Barony, and the Gorbals and a' about, they behoved to come into Glasgow no fair morning, to try their hand on purging the High Kirk o' Popish nick-nackets. My guess is that the Holy Father would enjoy that passage. Plenty o skirling limmers aboot wi Popish nich-nackets the noo. Three cheers for the people of Scotland who made the beginning of the Holy Father's visit such a stirring show of popular enthusiasm. 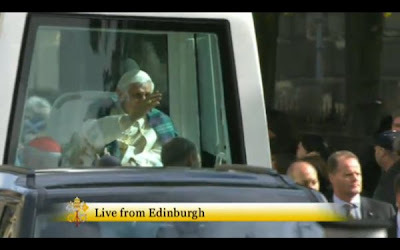 He's at lunch now with Cardinal O'Brien and other dignitaries, then, I hope, a brief siesta. Next item on the agenda is the Mass at Bellahouston. I'm off up to London now and will probably follow the Mass from there.